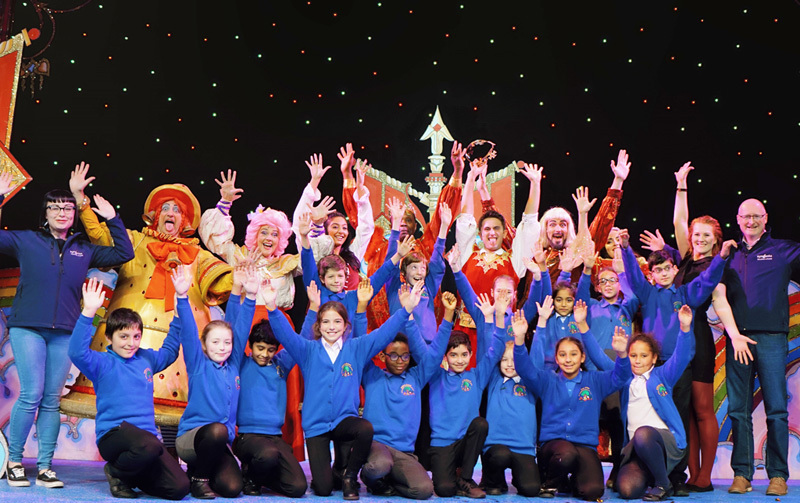 Four hundred school children were treated to a free pantomime trip from a partnership between the Lawrence Batley Theatre’s Christmas Angels appeal and Syngenta in Huddersfield. The children, who were from North Huddersfield Trust School, Ashbrow School and Netherhall Learning Campus were offered free tickets to Jack & The Beanstalk by Syngenta, who made a generous donation to the theatre’s Christmas Angels appeal through its Employees Community Gift Scheme, a fund where staff make donations from their salary. The fund even paid transport costs to get children to the theatre. The Christmas Angels appeal invites people to donate to a fund which then enables children and their carers to experience a unique theatre visit. They receive tickets to the pantomime, interval ice-creams and a special meet and greet. The appeal is now in its second year and will be returning for ALADDIN at the Lawrence Batley Theatre in 2018. Creating a fund means even small donations make a difference and now more than ever is an optimum time to donate to the LBT being match-funded by the Arts Council of England - doubling the donations. To make a donation or for more information about the LBT's Christmas Agngels appeal contact the Theatre on 01484 484438 or via the website www.thelbt.org/how-make-donations. Syngenta is proud to support its local communities and is helping humanity face its toughest challenge: how to feed a rising population, sustainably. Our world class science and innovative crop solutions transform how crops are grown to enable millions of growers to make better use of available resources.